Please see our guide here. If you now how to export via Construct 2 to Cordova, you can skip this point. If you are using additional cordova plugins, like the one Cranberrygame is selling, then check the guide above in order to avoid errors. In order to create a new certificate, please see our guide here. If you already have your certificates, you can skip this step. Open Intel XDK and click on the small user icon at the upper right corner. Then go to Developer Certificats, select iOS and click on “Import existing P12“. Choose your .p12 file and enter a description (to identify it later) and the password which you choosed during the creation process of this file. I recommend you to at a production and a developer certificate. So you can switch between both easily. Select your project and scroll down to the Build Settings tab. Select the Production file if you want to upload the ipa file to the store. Use the Development file in order to test it on your device without uploading it to the store before. Depending on what you want to do later with your export, choose either adhoc or production. This will generate a new folder called package-asset in your project root folder. Please download and copy your .mobileprovision files into this folder and select them in the upcoming fields. Once you are ready, go to the build tab. But make sure, that you have verified your settings. Most build errors are caused by not matching certificates. 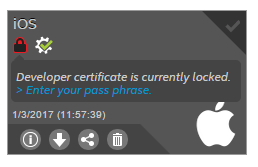 Go to the build tab and unlock your certificate by clicking the small lock icon. Enter your password for the certificate. Click on Unlock. Then select the iOS tab for build and click on Start Builds. 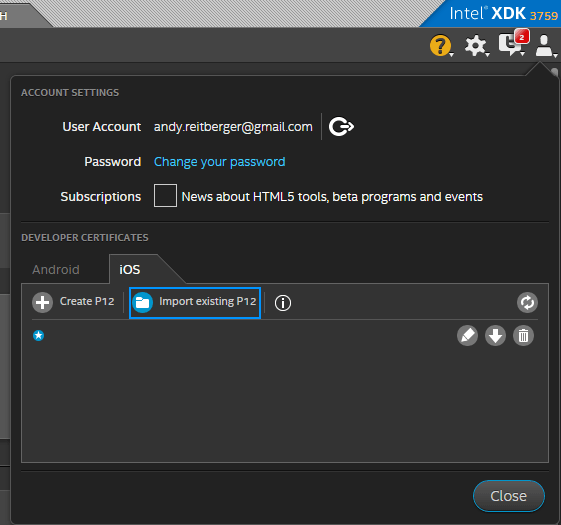 Intel XDK will then start to build your application. This can take a few minutes. You’ll get a mail once the build has finished. Then you can either go back to the build tab and download your application or you click the link in your notification mail. I have a question, I’ve built my iOS app on xdk about 5 times now. Apple was rejecting it because of some explicit language within my app so I had to go into my game thru construct 2 and fix my language. I’ve exported my app again this final time using Cordova and I’m trying to build again on xdk but I keep getting build error and it takes hrs and hrs to build which never happened before. What could be the problem, please help me. Intel XDK has deprecated their crosswalk export. Now it’s using Adobe Phonegap as cloud compiler. Since that I’ve completely abandoned Intel XDK. So I’m not sure if this still is working like this. What exact issue do you get while adding your keys? Please use our support forum to get quicker help.